Eyes on the ball, a photo by The Bacher Family on Flickr. In the summer of 2012, I spent two days photographing a local Fastpitch Tournament sponsored by the Eatonville Youth Sports Association. Nine teams competed in double-elimination brackets in two age ranges over a two-day period, with two games happening at any given time on ballfields across town from one another. It kept me hopping to document it all, but it was also a lot of fun! 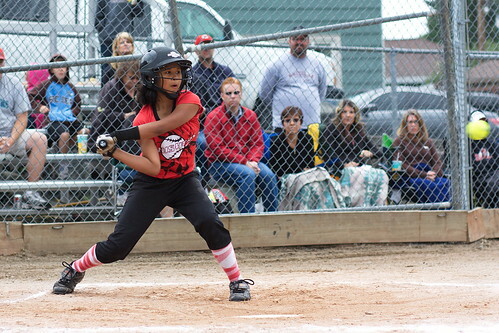 One of the great challenges, of course, is to capture that ephemeral moment when the softball enters the frame and the batter, eyes on the ball, leaning in on the leading leg, begins her swing. People ask me all the time with photos like this one: did she hit the ball? Truth is, I don't remember, and truth is, I don't care. What matters is this instant, frozen in time, with the potential for both a strike and a home run suspended together in the same moment.